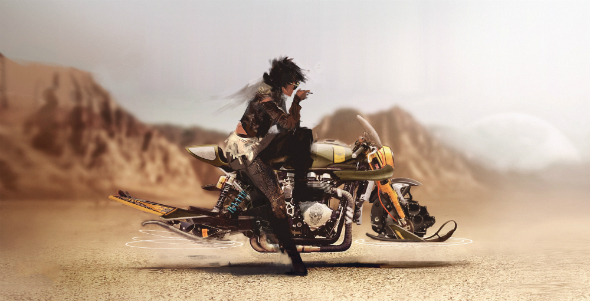 Beyond Good & Evil 2 was originally announced back in 2009 before it disappeared for a number of years. But at E3 2017 it made a surprise return with an impressive cinematic trailer during Ubisoft’s press conference. But here’s the thing: this wasn’t the sequel we had seen originally. So what’s going on? Need to catch up on the original Beyond Good & Evil? Check out our quick guide. It turns out creative director Michel Ancel and his team have since re-assessed what this sequel will be. Rather than following Jade, the photojournalist from the first game, in another adventure, we’re going back in time to an era before the first game. Below you’ll find all the information we have on this upcoming prequel so far. There’s no release date or even any release platforms announced for Beyond Good & Evil 2 yet. However, there were suggestions from one of the game’s webpages that it would be coming to PC, PlayStation 4, and Xbox One. But that could also simply be target platforms for now and, as such, are likely to change. As we learned soon after that webpage was altered by Ubisoft, Beyond Good & Evil 2 is at what Ancel called “day zero of development,” meaning that it’s a long way off yet. By the time it’s finished, then, those consoles may be long dead. Our PCs will still be kicking around, though – probably with upgraded tech by then, too. The setting that Ancel invented for Beyond Good & Evil is so large that he originally planned for the series to be a trilogy in order to explore it all. We’ve only seen a small portion of it with the first game, but this prequel will show us much more, not least because it’s planned as a huge, open world this time around. One of the defining features of the Beyond Good & Evil universe is that it’s set far into the future when humans and other civilisations have spread into space and colonised other solar systems. While there are typical sci-fi elements such as aliens and advanced artificial intelligence, its most distinctive feature is that humans co-exist with anthropomorphic animals. In the first game, Jade’s “uncle” is a large pig-man called Pey’j, for instance. System 3 is newly colonised and has since become a hub of interstellar trade in the Milky Way. Private corporations are based there as it has a vast store of cosmic resources which they’re now all battling over. This corporate war has bred the conditions necessary for a new era of space piracy. Narrative director Gabrielle Shrager explains that the game’s vision of the future imagines that China and India became the superpowers. With that power they took off from Earth and began to spread their weight across the universe with a colonisation programme. You can expect many of the locations in Beyond Good & Evil 2 to bear cultural influences from the East, then. This can be seen in the city demoed at E3 2017, called Ganesha – created by the first Indian colonists, it features a huge statue of Ganesh, the elephant-headed deity of Hinduism. Other cities in the game will be shaped by Chinese culture, Mongolian culture, and “as many Earth cultures as we can represent,” Shrager says. We’re also told to expect entirely new religions invented by different cultures found throughout the game. 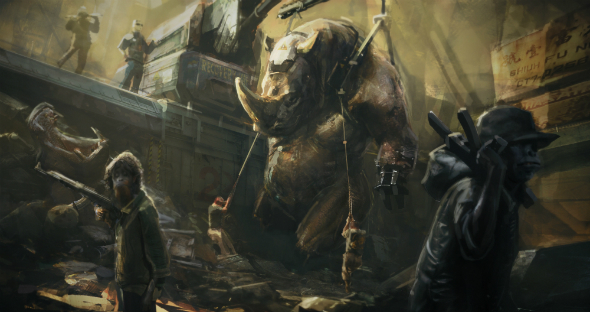 The team began working on the technology that will power Beyond Good & Evil 2 three years ago. It started out as a solar system simulator and has been refined from that point so that the team can now start building the game inside of it. One of the big features of this technology is that planets orbit stars and, as they do, the sunlight cast upon planets is affected. There’s proper science driving all of the game’s atmospheric conditions. “When you see the sunset, it’s not just colours, it’s the real sun going into this position,” Ancel says. “If you know what a sunset is, a sunset is a modification of the colour of the sun depending on the angle of the atmosphere.” Beyond Good & Evil 2 simulates this. The game will make use of a whole solar system being simulated by letting you travel between planets. To pull this off, the technology is able to zoom in on a tiny detail and pull right back to observe a whole planet without loading screens or any other interruption. Ancel demonstrated this during E3 by pulling the camera out from a character on a planet until it was far away in outer space. You can see these technology in action in the video above. As the team is working on such a huge scale – from millimetre precise details up to global panoramas – they’re using a mix of hand-crafted design and procedural generation to pull it off. “Cities can grow by themselves, they can be destroyed, they can connect to others,” Ancel says. “Everything is alive, in fact, it’s not pre-scripted. So it’s a balance. We can say, ‘this part of the planet has those kinds of resources,’ and depending on those things, kind of emergent things… today, we can hand-craft everything, or we can decide to have a kind of robot that is going to calculate the history of the planet. “Even us, we don’t know exactly what’s on this planet. We know there are things, but we don’t know exactly where they are, we don’t know exactly what it is,” he adds. The galaxy is filled with systems that all link together. For example, asteroids can crash into planets and actively deform the terrain. The crash won’t just affect the shape of the land, though; corporations in the cities will send slaves to mine the asteroids for raw materials, contributing to the living cycle of the planet and its societies. You’ll join a colourful band of nefarious space pirates in Beyond Good & Evil 2. Unlike the first game, you’ll be able to create your own character, and they can be male or female depending on your preference. Characters who will be in your crew that were shown in the E3 trailer include Knox – a cheeky monkey-human hybrid who speaks with a London accent. He has a couple of golden teeth and a mechanism on his arm that fires a hand-shaped grapple hook. Knox also has a jetpack so he can travel around in the sky. He works with Shani, a badass biker and ingenious mechanic of Somalian ancestry. Shepicks Knox up on a flying motorbike to escape from the police after they pull off a dodgy deal. The pair then return to the Gada, their pirate ship and flying home, to meet up with the rest of the crew and deliver the goods. On board are seen various hybrids and a couple more humans. There’s a shark, a rhino and, most importantly, a woman called Dakini who appears to be the captain. She has a robotic hand and green eyes – Ancel says the colour is significant as it ties Dakini with Jade from the first game, so maybe it’s her grandmother? Other characters who were given substantial air time in the trailer include Zhou Yuzhu, a hybrid pig who is both a pretentious collector and ruthless crime boss. Then there’s also Li Daiyu, who is a “rejuvenated madam” that runs the back rooms of Yuzhu’s business. The story of Beyond Good & Evil 2 follows the crew of the pirate ship Gada. As space pirates, the crew is at the low level of its social system, but as they hustle their way through the game they’ll make new friends and gain more resources. Ancel says he chose the theme of piracy for the game “because pirates accept anyone who wants to be part of their crew irrespective of origin. Pirates stick together.” Importantly, the pirates in the game aim to stick it to authority figures as they steal from corporations and criminals alike. It also seems that they’re out to both free and recruit the underdogs in each society. Those underdogs are, for the most part, the human-animal hybrids. It turns out they’re created in labs and designed to withstand the harsh conditions of different planets. The reason being that the hybrids are enslaved by the corporations as labourers, being used to make planets safe for colonisation, and then build huge cities upon them. In a cruel twist, those cities are often decorated with temples and statues in the shape of hybrid gods from Old Earth’s cultures – once worshipped, the hybrids are now the lowest rung of society. This is a very different reality for hybrids that we saw in the first Beyond Good & Evil. In that game, they were free to roam the universe as they wish, but in the prequel we see them treated as slaves. This is explained by way of the game’s timeline. As this is a prequel, it’s set around 200 years before the first game, a few generations before Jade – the first game’s protagonist – is born. What this suggests is that there comes a time when the hybrids are emancipated – perhaps that’s something we’ll see happen in this prequel. The other hint of a story we’ve seen so far comes at the end of the E3 trailer. When Knox throws Dakini the disc he stole from Zhou Yuzhu, she inserts it into the Gada’s computer, which brings up a 3D map of the galaxy showing the location of a mysterious artefact. “True freedom lies beyond,” Dakini says. Perhaps that artefact is something we’ll be pursuing in the game. However, there are dead bodies floating around it, so it would appear to be very dangerous. When you start playing Beyond Good & Evil 2 you will be cast at the very bottom of society. You’ll have no crew and hardly any resources with which to have any influence over the world. What you will probably start out with, though, is a small space tuk-tuk. The idea is to explore the world, trading in goods and completing missions, all in order to progress from those small beginnings to become an all-powerful space pirate. To do that, you’ll need to scout the city you start out in, do some favours to make some friends, and eventually start acquiring better vehicles and equipment. We know that, at some point, you’ll meet up with the crew of the Gada, and be able to join them for larger adventures on different planets, discovering new cultures and getting lost in all types of spectacular architecture and environments. The Gada will act as a hub that you can return to, somewhere you can catch up with the crew you’ve assembled, and develop new skills between you all. If this makes the game sound like an RPG, then yes, the game seems to be structured like an open-world RPG. In terms of travelling around the game’s world, you’ll be able to walk and run, but also fly around with a jetpack, as well as commandeer small flying vehicles like motorbikes and cars. It’s been described as “GTA in space” as you have freedom to move around, cause trouble, and interact with people and buildings in huge living cities. Beyond that, you’ll be able to acquire larger ships that let you break through the atmosphere of a planet and fly seamlessly into space – kinda like in No Man’s Sky. There hasn’t been any word on spaceship combat yet but you can probably expect it. Beyond Good & Evil 2 will also have online fuctionality but exactly how it will work hasn’t been revealed. There will also be co-op. The official word is that “you can play alone or with friends, everyone will take part in the intense action and drama found through System 3’s planets, moons, and space.” Whether that means it will be online or local co-op isn’t known yet. 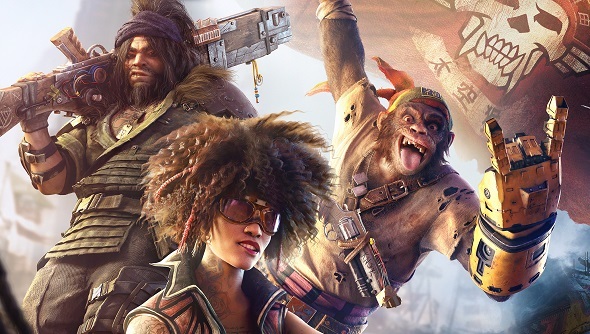 Now that Beyond Good & Evil 2 has been properly re-announced, Ubisoft are looking to bring in prospective players to the development process, acquiring feedback and suggestions. Towards this, they’ve launched the Space Monkey Program, which you can sign-up to, and will be invited to test and experience different parts of the game as they’re made.